NASHVILLE, TENN. – Kerry Glen Anderson, 52, president of the Gospel Advocate Company, died Aug. 13, 2013. Anderson had been president of the company since Sept. 25, 1997. Anderson was a 1981 graduate of Lipscomb University and had a master’s degree in policy development from Vanderbilt University. 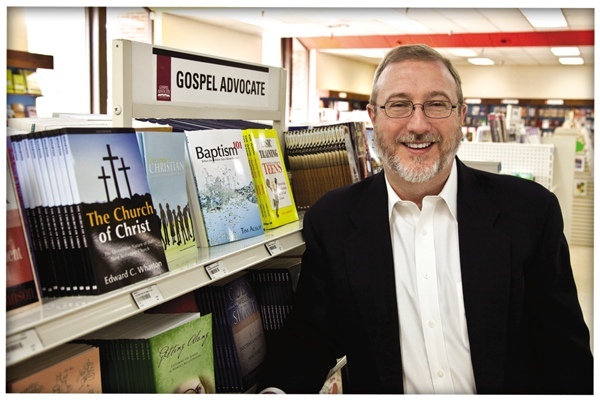 Before joining the Gospel Advocate, he worked for AT&T and First American National Bank. He attended the Crieve Hall Church of Christ. Founded in 1855, the Gospel Advocate is the oldest publisher serving the churches of Christ through magazines, Bible class curriculum, books and other resources. Past leaders of the Gospel Advocate include David Lipscomb, B.C. Goodpasture, Ira North, and J.C. and David McQuiddy. The Anderson family purchased the company from McQuiddy Printing in 1990 with the goal of continuing to contribute to the education of Christians and helping them to build a strong heritage of faith in their children. Neil W. Anderson, publisher and owner of the Gospel Advocate, was president of the company from 1981 to 1997. While Anderson was president, the Gospel Advocate moved from traditional printing methods to desktop publishing. He successfully implemented a new inventory management and web ordering system and helped develop the GA Bible Study Library on CD. The latest improvement under his guidance had been the conversion of the GA’s library of books into e-books. Anderson is survived by his son, Matthew Anderson; his parents, Neil and Glenda Anderson; his sister and brother-in-law, Neila and Nelson Whitfield; and two nephews, Connor and Clayton Whitfield. In lieu of flowers, the family requests that memorial contributions be sent to Crieve Hall Church of Christ Youth Group, 4806 Trousdale Dr., Nashville, TN 37220.